Not always, but usually. Generally, there is no need for a charge controller with the small maintenance, or trickle charge panels, such as the 1 to 5 watt panels. A rough rule is that if the panel puts out about 2 watts or less for each 50 battery amp-hours, then you don't need one. The obvious question then comes up - "why aren't panels just made to put out 12 volts". The reason is that if you do that, the panels will provide power only when cool, under perfect conditions, and full sun. This is not something you can count on in most places. The panels need to provide some extra voltage so that when the sun is low in the sky, or you have heavy haze, cloud cover, or high temperatures*, you still get some output from the panel. A fully charged "12 volt" battery is around 12.7 volts at rest (around 13.6 to 14.4 under charge), so the panel has to put out at least that much under worst case conditions. *Contrary to intuition, solar panels work best at cooler temperatures. Roughly, a panel rated at 100 watts at room temperature will be an 83 watt panel at 110 degrees. 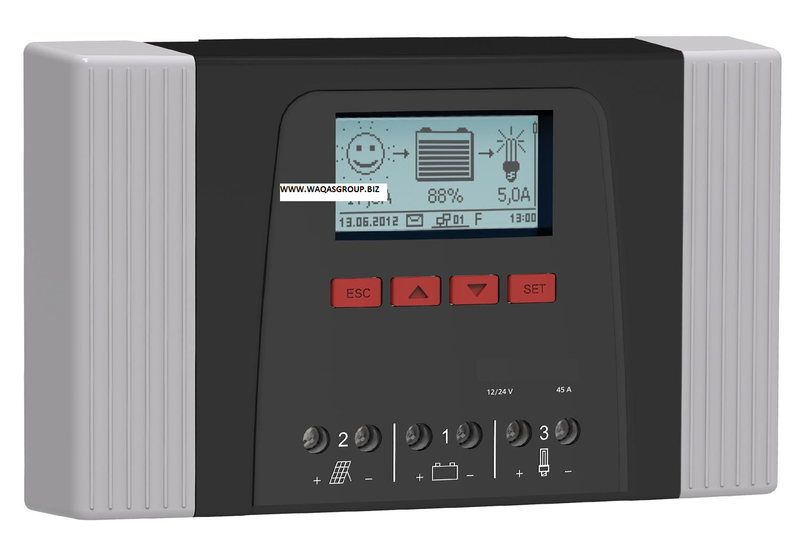 Detailed information on MPPT charge controllers. The charge controller regulates this 16 to 20 volts output of the panel down to what the battery needs at the time. This voltage will vary from about 10.5 to 14.6, depending on the state of charge of the battery, the type of battery, in what mode the controller is in, and temperature. (see complete info on battery voltages in our battery section). Nearly all PV panels rated over 140 watts are NOT standard 12 volt panels, and cannot (or at least should not) be used with standard charge controllers. Voltages on grid tie panels varies quite a bit, usually from 21 to 60 volts or so. Some are standard 24 volt panels, but most are not. Standard (that is, all but the MPPT types), will often work with high voltage panels if the maximum input voltage of the charge controller is not exceeded. However, you will lose a lot of power - from 20 to 60% of what your panel is rated at. Charge controls take the output of the panels and feed current to the battery until the battery is fully charged, usually around 13.6 to 14.4 volts. A panel can only put out so many amps, so while the voltage is reduced from say, 33 volts to 13.6 volts, the amps from the panel cannot go higher than the rated amps - so with a 175 watt panel rated at 23 volts/7.6 amps, you will only get 7.6 amps @ 12 volts or so into the battery. Ohms Law tells us that watts is volts x amps, so your 175 watt panel will only put about 90 watts into the battery. The only way to get full power out of high voltage grid tie solar panels is to use an MPPT controller. See the link above for detailed into on MPPT charge controls. Since most MPPT controls can take up to 150 volts DC (some can go higher, up to 600 VDC) on the solar panel input side, you can often series two or more of the high voltage panels to reduce wire losses, or to use smaller wire. For example, with the 175 watt panel mentioned above, 2 of them in series would give you 66 volts at 7.6 amps into the MPPT controller, but the controller would convert that down to about 29 amps at 12 volts. Charge controls come in all shapes, sizes, features, and price ranges. They range from the small 4.5 amp (Sunguard) control, up to the 60 to 80 amp MPPT programmable controllers with computer interface. Often, if currents over 60 amps are required, two or more 40 to 80 amp units are wired in parallel. The most common controls used for all battery based systems are in the 4 to 60 amp range, but some of the new MPPT controls such as the Outback Power FlexMax go up to 80 amps. Simple 1 or 2 stage controls which rely on relays or shunt transistors to control the voltage in one or two steps. These essentially just short or disconnect the solar panel when a certain voltage is reached. For all practical purposes these are dinosaurs, but you still see a few on old systems - and some of the super cheap ones for sale on the internet. Their only real claim to fame is their reliability - they have so few components, there is not much to break. 3-stage and/or PWM such Morningstar, Xantrex, Blue Sky, Steca, and many others. These are pretty much the industry standard now, but you will occasionally still see some of the older shunt/relay types around, such as in the very cheap systems offered by discounters and mass marketers. Maximum power point tracking (MPPT), such as those made by Midnite Solar, Xantrex, Outback Power, Morningstar and others. These are the ultimate in controllers, with prices to match - but with efficiencies in the 94% to 98% range, they can save considerable money on larger systems since they provide 10 to 30% more power to the battery. For more information, see our article on MPPT. Most controllers come with some kind of indicator, either a simple LED, a series of LED's, or digital meters. Many newer ones, such as the Outback Power, Midnite Classic, Morningstar MPPT, and others now have built in computer interfaces for monitoring and control. The simplest usually have only a couple of small LED lamps, which show that you have power and that you are getting some kind of charge. Most of those with meters will show both voltage and the current coming from the panels and the battery voltage. Some also show how much current is being pulled from the LOAD terminals. Equalization does somewhat what the name implies - it attempts to equalize - or make all cells in the battery or battery bank of exactly equal charge. Essentially it is a period of overcharge, usually in the 15 to 15.5 volt range. If you have some cells in the string lower than others, it will bring them all up to full capacity. In flooded batteries, it also serves the important function of stirring up the liquid in the batteries by causing gas bubbles. Of course, in an RV or boat, this does not usually do much for you unless you have been parked for months, as normal movement will accomplish the same thing. Also, in systems with small panels or oversized battery systems you may not get enough current to really do much bubbling. In many off-grid systems, batteries can also be equalized with a generator+charger. Quite a few charge controls have a "PWM" mode. PWM stands for Pulse Width Modulation. PWM is often used as one method of float charging. Instead of a steady output from the controller, it sends out a series of short charging pulses to the battery - a very rapid "on-off" switch. The controller constantly checks the state of the battery to determine how fast to send pulses, and how long (wide) the pulses will be. In a fully charged battery with no load, it may just "tick" every few seconds and send a short pulse to the battery. In a discharged battery, the pulses would be very long and almost continuous, or the controller may go into "full on" mode. The controller checks the state of charge on the battery between pulses and adjusts itself each time. The downside to PWM is that it can also create interference in radios and TV's due to the sharp pulses that it generates. What is a Load, or "Low Voltage Disconnect" output? Some controllers also have a "LOAD", or LVD output, which can be used for smaller loads, such as small appliances and lights. The advantage is that the load terminals have a low voltage disconnect, so it will turn off whatever is connected to the load terminals and keep from running the battery down too far. The LOAD output is often used for small non-critical loads, such as lights. A few, such as the Xantrex C12, can also be used as a lighting controller, to turn lights on at dark, but the Morningstar SLC lighting controller is usually a better choice for that. Do not use the LOAD output to run any but very small inverters. Inverters can have very high surge currents and may blow the controller. Most systems do not need the LVD function - it can drive only smaller loads. Depending on the rating of the controller, this may be from 6 to 60 amps. You cannot run any but the smallest inverter from the LOAD output. On some controllers, such as the Morningstar SS series, the load output can be used to drive a heavy duty relay for load control, gen start etc. The LOAD or LVD output is most often used in RV & remote systems, such as camera, monitor, and cell phone sites where the load is small and the site is unattended. What are the "Sense" terminals on my controller? Some charge controllers have a pair of "sense" terminals. Sense terminals carry very low current, around 1/10th of a milliamp at most, so there is no voltage drop. What it does is "look" at the battery voltage and compares it to what the controller is putting out. If there is a voltage drop between the charge controller and the battery, it will raise the controller output slightly to compensate. What is a "Battery System Monitor"? Battery system monitors, such as the Bogart Engineering TriMetric 2025 are not controllers. Instead, they monitor your battery system and give you a pretty good idea of your battery condition, and what you are using and generating. They keep track of the total amp-hours into and out of the batteries, and the battery state of charge, and other information. They can be very useful for medium to large systems for tracking exactly what your system is doing with various charging sources. They are somewhat overkill for small systems, but are kind of a fun toy if you want to see what every amp is doing :-). TriMetric's new PentaMetric model also has a computer interface and many other features. For a complete list of all our charge controllers, to check pricing, or to order online, see our Charge Controller page on our web store.